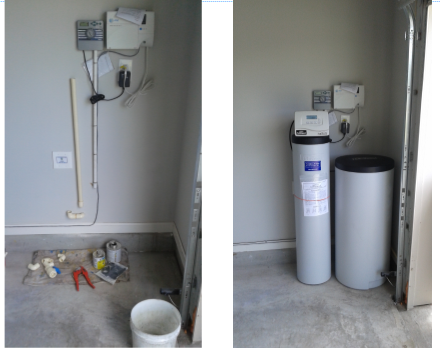 This post will answer the question of how to install a water softener in Jacksonville FL. First, to install a water softener system you will need to access 3 main items. The 3 items needed are a main water supply feed pipe, an acceptable drain and a power outlet. The main water supply pipe will supply the water softener with water. The drain will handle the discharge water produced by a water softener, while the power outlet will supply the water softener with the power that it needs. The main water supply pipe enters your home through the concrete foundation. We call this location the point of entry because this is where the supply pipe feeds your home. So, locating the point of entry is the first step for installing a water softener in Jacksonville FL. Once you have located the point of entry then you will be able to determine the water softener location at your home. Sometimes a main water supply pipe enters your home on the garage side of the home which allows a water softener will be installed in the garage. However, if the main water supply pipe enters your home on the non garage side then you may have to install it outside. The location of the main water supply pipe determines where a water softener installation can occur at your home. A water softener will periodically rinse itself discharging water so you will need to find an acceptable drain. The best drain location which is also the most accessible is the washing machine drain. Most of the time washing machines, and their drains, are located close to your garage making them ideal. A drain pipe can be installed by drilling a small hole through the garage wall into the laundry room then running a drain line to the washing machine drain. Or, we can run it up into the attic and down inside the wall accessing the drain that way. Either method will work fine. While washer drains are the most ideal they are not the only drains that will work. If you cannot access a washer drain then consult a local water softener installation expert for code approved acceptable drain options. Most Jacksonville Fl water softener systems will need electricity to power the control valve. However, most home builders install very few power outlets inside garages. Water softeners usually have a transformer that steps down your 110v outlet to run the control valve. And depending on the water softener installation location you may not have a power outlet available. It’s important to not plug the water softener transformer into an extension cord local codes do not permit this. If you find this is the case at your home you have two options. You can either have the lower current wire modified to the length needed to work for your situation. Or, you can hire an electrician to install an outlet at the water softener location. Please comment on this post if you have any questions.